PHILADELPHIA (Jack Pfeifer for The Penn Relays) – Sarah Bowman ran on three championship distance relay teams for Tennessee at last year’s Penn Relays, was named Outstanding Competitor, then graduated a month later. Yet Coach J.J. Clark’s Volunteers are back with a powerhouse women’s group this season and again are the team to beat. That’s in part because they have Phoebe Wright, Kimarra McDonald and Chanelle Price back – Price and Wright contributed legs on all three winners a year ago, McDonald two – and they are joined this year by veterans Jackie Areson and Brittany Sheffey. Sheffey, a junior from Bellport, N.Y., anchored Tennessee’s winning distance medley relay team at last month’s NCAA indoor championships, holding off the closing charge of Oregon freshman Jordan Hasay. She and Areson have shown considerable improvement in the past season. Sheffey, who redshirted last year outdoors, has improved from 2:09 to 2:06 in the 800, 4:24 to 4:19 in the 1,500 and 9:38 to 9:26 in the 3k. Areson, a senior from Delray Beach, Fla., has run PRs this year of 4:43 mile, 9:07 3k and 15:51 5k. She placed 3rd in the NCAA indoor 5k last month. With Bowman’s departure, Wright, a senior, has stepped up to fill her shoes and has become the team’s ace. In the 800 she has run 2:01.12 and was NCAA indoor champion, and she ran a recent 1,500 PR, 4:15.66. Price, a brilliant sophomore, has run 2:01.61 in the 8, 4:46.87 in the mile. At the 2010 Relays, the Volunteers will have a new challenger in the form of the Oregon Ducks, whose women’s distance runners have not competed here before. The Oregon women won the team championship at this year’s NCAA indoor meet; Tennessee won the title in 2009. The Ducks are led by newcomers Hasay and Anne Kesselring and the veterans Nicole Blood, Zoe Buckman and Alex Kosinski. Of those five, only Blood, a senior originally from Saratoga Springs, N.Y., has run at Franklin Field before. She ran on the Saratoga High School DMRs in 2003 and 2004, anchoring them to victory in ’04 as a sophomore. Her split that day of 4:46.6 is the 3rd-fastest ever run at the Relays in the girls DMR. As a collegian she was NCAA runnerup in the 5,000 meters last spring, and has a 1,500 PR of 4:14.73. Hasay and Kosinski are Californians, Kesselring from Germany and Buckman Australia. Hasay set the national high school record in the girls’ 1,500 in 2008, running 4:14.50. Buckman, who has been an 800 specialist, stepped up to the 1,500 in March and ran 4:12.80, the fastest by a collegian so far this year. Kesselring ran a PR 4:18.80 at Stanford this spring, while Kosinski, recovering from injury, debuted with a 4:22 in April. She has a best of 4:18. In the 4x8, Oregon expects to add freshman Chloe Steinbeck, who PR’d at 2:07 this winter. For the 400 leg of the DMR, they could call on Keshia Baker, who has run 51. Two other schools, Georgetown and Villanova, can nearly make that claim. • Georgetown Christine Whalen (4:20.2) and Renee Tomlin (4:16.7) ran on the Hoyas’ 4x15 last year. Coach Pat Henner can also call on Lauren Gregory (4:21.32), a senior from New Jersey, and Avril Ogrodnick (4:19.24), a graduate student from Quebec. In the 4x8 they will look to Tomlin (Ocean City, N.J.) and Whalen (Los Gatos, Calif.), both of whom have run 2:06. Emily Infeld, who ran 4:15 last year as a freshman, is redshirting this spring. 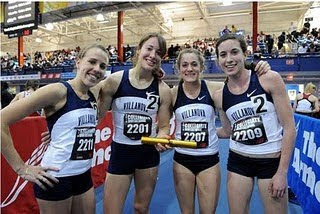 Emily’s older sister, Maggie, a senior a year ago, anchored the Hoyas to 2nd in the DMR and 4x15 last year. • Villanova The “home team” Wildcats, coached by Gina Procaccio to last fall’s NCAA cross country championship, are led by senior Nicole Schappert (4:17.99) and junior Sheila Reid (4:35.70 mile). They are joined by Bogdana Mimic (4:19.67), a sophomore from Serbia, and Brooke Simpson , a sophomore from Australia who ran 4:17 5 years ago. Ellen Dougherty (4:18.66), a senior from Riverhead, N.Y., may also be available, along with Alison Smith (4:26) and freshman Ariann Neutts (2:08). Villanova last won the 4x8 in 1997, the 4x15 in 2000 and the DMR in 2006. Last year they finished 4th in the 4x15 and 3rd in the DMR. Schappert is the daughter of Ken Schappert, who won eight watches on winning Villanova distance relay teams between 1971 and 1975. • Arkansas Coach Lance Harter’s young squad ran 11:06.56 indoors in the DMR. They are led by freshmen Stephanie Brown (2:05/4:46 mile) and Paige Johnston (2:51 1000) and sophomore Kristen Gillespie (2:07/4:43), along with veteran Jillian Rosen (4:18 1500). 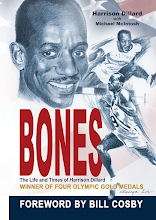 • Boston College Coach Randy Thomas had a splendid indoor season, running 11:05.69 in the DMR, thanks to sisters Caroline (2:07/4:21) and Jillian (2:08/4:27) King, from Scotia-Glenville, N.Y., and Canadian Caitlin Bailey (2:04). • West Virginia The Mountaineers are loaded, especially in the 4x15 where they have West Virginia natives Keri Bland (4:16), Kaylyn Christopher (4:40 mile) and Karly Hamric (4:38) and Canadians Jessica O’Connell (4:19) and Marie-Louise Asselin (4:25). In the DMR they also have an excellent quartermiler in April Rotilio. You also can’t ignore Connecticut (8:41 4x8), Duke (8:51/11:22), Princeton (8:52) and Cornell (8:53). The DMR field has 9 of the 12 teams that ran in this year’s NCAA indoor championship race – winning Tennessee and runner-up Oregon, both of which ran 10:58; Georgetown (3), Villanova (4), Arkansas (7), West Virginia (8), Michigan (10), Boston College (11) and Indiana (12).